The Royal London Hospital, established in 1740 and employing 4,800 staff is the principal trauma centre for London and the largest renal unit in Europe. St Bartholomews, the oldest hospital in Europe (established in 1123) and employing 2200 staff, is a cardiac & cancer centre of excellence. In 2006, Barts and The London NHS Trust commissioned Skanska to manage a £1 billion ‘PPI’ project and redevelop St Bartholomew’s Hospital and The Royal London Hospital as part of the largest ever public private partnership in Europe. The project is due to last 10 years and involves the design, demolition, construction and refurbishment of two hospital sites to make way for a new ‘state-of-the-art’ hospital complex covering an area of 270,000m2 in Central London. Part of the scheme comprised the construction of a new reinforced concrete framed building with a large podium area and three towers ranging from 10 to 18 floors. 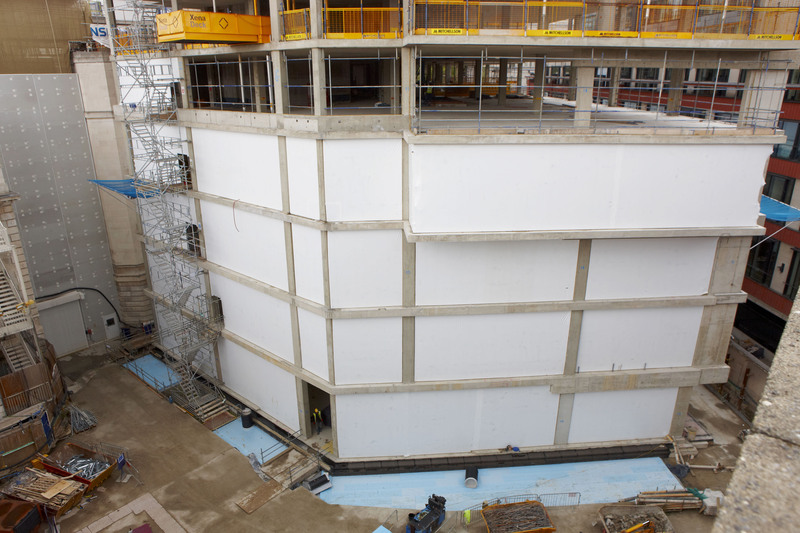 Skanska, approached Rhino Shrink Wrap to find a way of providing weather protection to the building before the concrete frame and external cladding was finished, to enable internal building work to start ahead of schedule. The normal practice for temporary sheeting is to erect a scaffolding and attach the Rhino Shrink Wrap sheeting to that. However, for this project Rhino fixed a temporary wooden batten ‘window frame’ around each opening in the RC frame. Next we battened our 300µm thick, Verisafe® flame retardant shrink wrap sheeting around each opening. The final stage in the process was to heat shrink the plastic ‘drum tight’. It is the drum tight fit that gives shrink wrap sheeting it’s increased durability and resistance to damage from high winds when compared with traditional sheeting solutions. This was the first time that shrink wrap sheeting had been used to encapsulate a building ‘floor by floor’ in this way and the result was to create a weather tight envelope. Reports from Skanska indicated that the shrink wrap sheeting solution allowed the internal works to move 6 months ahead of schedule which created cost savings but also reduced the risks of down time and project overrun fees. Once the buildings’ permanent external cladding is fixed, the Rhino Shrink Wrap sheeting will be removed in sections and recycled. Heat shrunk ‘drum tight’ – very resistant to damage from high winds. Versatile – can be cut and resealed for access or protrusions and remain weather tight. Smart & professional appearance for high profile projects. Easy to remove after use & 100% recyclable. The client’s schedule sometimes meant that our teams were working on floors simultaneously. On a site of this size, frequent moves could take a lot of time. It was important to be well organised. Our teams found drilling the holes in the RC frame required to fix the temporary batten ‘window frame’ very challenging. Some research led us to specifically designed ‘Hilti’ tools and fixings which we have used with great success on later projects. Whilst the shrink wrap sheeting provided robust weather protection, it was found that at some points on the concrete slab floor, water could ‘pool’ and seep underneath the batten and shrink wrap. The solution was to use a flexible sealant under the batten. For recent projects we have used a self adhesive backed foam underneath the batten which fills any small gaps in the concrete slab and prevents water ingress. 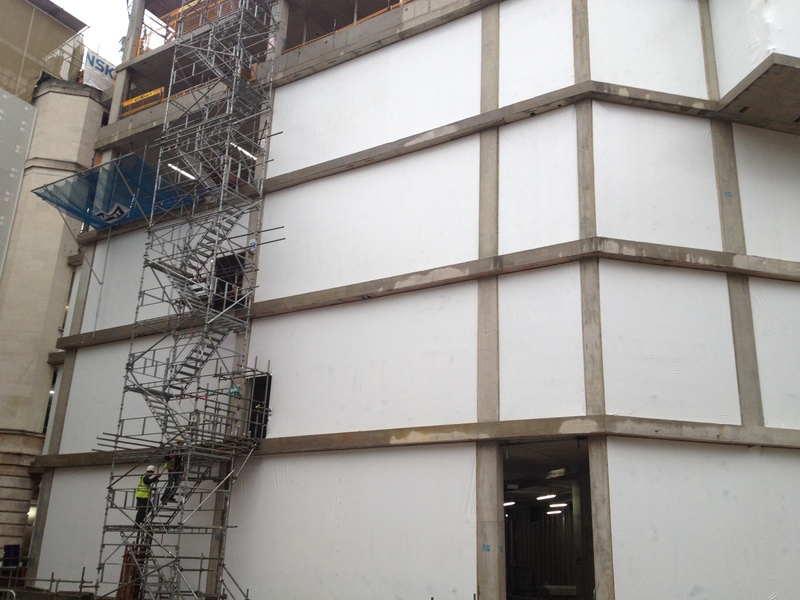 By creating a durable temporary shrink wrap skin around the reinforced concrete frame, interior fit out works could proceed ahead of schedule before the permanent building cladding was applied.